Enjoy, preserve and promote sustainability in Alaska Fisheries. As of 2013 season, the Kustatan Tent Camp division is operating under new ownership. Feel free to continue to use the resources and links on this website. 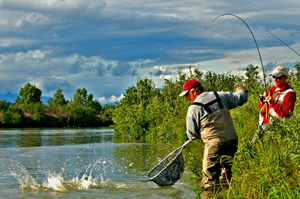 If you wish to purchase this site or lease advertising space, we are still providing marketing for guide businesses, and providing information for people traveling to and fishing, camping in Alaska. Our fly-out fishing trips provide a relaxed atmosphere, great fishing and a personal experience you just can't find on the road. No traffic, no fighting for a spot on the river, no one telling you to be here or there...it is just you, the wilderness and some good friends who wouldn't believe your fishing stories if they hadn't come too. Our guides are experienced Alaskan guides. They are licensed, fully insured and provide you a safe and memorable Alaskan adventure.